The 1926 Miami hurricane, commonly called the "Great Miami" hurricane, was a large and intense tropical cyclone that devastated the Greater Miami area and caused extensive damage in the Bahamas and the U.S. Gulf Coast in September 1926, accruing a US$100 million damage toll. As a result of the destruction in Florida, the hurricane represented an early start to the Great Depression in the aftermath of the state's 1920s land boom. It has been estimated that a similar hurricane would cause about $235 billion in damage if it were to hit Miami in 2018. The tropical cyclone is believed to have formed in the central Atlantic Ocean on September 11. [nb 1] Steadily strengthening as it tracked west-northwestward, the tropical storm reached hurricane intensity the next day. As a result of scattered observations at open sea, however, no ship encountered the storm until September 15, by which time the cyclone had reached major hurricane intensity north of the Virgin Islands. Strengthening continued up until the following day, when the storm reached peak intensity with a strength equivalent to a Category 4 hurricane. This intensity was maintained as the storm tracked across the Turks and Caicos and the Bahamas to landfall near Miami on September 18. The cyclone caused immense destruction throughout the islands and across southern Florida. The storm destroyed hundreds of structures in its path over the islands, leaving thousands of residents homeless. At least 17 deaths occurred on the islands, though many others—some related only indirectly to the storm—were reported in the aftermath. Upon striking South Florida, the cyclone generated hurricane-force winds over a broad swath of the region, causing widespread and severe structural damage from both wind and water. Most of the deaths occurred near Lake Okeechobee, when a large storm surge breached muck dikes and drowned hundreds of people. The hurricane quickly traversed the Florida peninsula before emerging into the Gulf of Mexico near Fort Myers. The storm flooded surrounding communities and barrier islands, while strong winds downed trees and disrupted electrical service. The storm later made two landfalls with weaker intensities on Alabama and Mississippi on September 20 and 21, respectively. The storm caused additional but less severe damage in those states, primarily from heavy rains and storm surge. Land interaction caused the cyclone to deteriorate and later dissipate on September 22. Due to the sparseness of available observations in the central Atlantic, the specific origins of the 1926 Miami hurricane remain unclear. Operationally, the United States Weather Bureau in Washington, D.C., did not begin issuing advisories on the cyclone until September 14. However, the tropical cyclone is first listed in HURDAT—the official Atlantic hurricane database—as having begun as a tropical storm with maximum sustained winds of 65 miles per hour (100 km/h) roughly 1,100 mi (1,770 km) east of the island of Martinique in the Lesser Antilles on September 11. Tracking west-northwestward, the storm gradually intensified and reached hurricane intensity on September 12 while still east of the Lesser Antilles. The observation of low barometric pressures and winds suggesting cyclonic rotation at Saint Kitts on the evening of September 14 was the first to suggest that a hurricane had developed. The following day, the steamship Matura encountered the strengthening tropical cyclone and documented a minimum pressure of 28.82 inches of mercury (976 mb). By 06:00 UTC on September 15, the storm had strengthened further to major hurricane intensity north of the Virgin Islands. Strengthening continued into September 16 as the hurricane reached a strength equivalent to that of a Category 4 on the modern-day Saffir–Simpson hurricane wind scale. Although no official minimum pressure readings were taken in the area at the time, the tropical cyclone peaked in wind-based intensity at 18:00 UTC on September 16 with sustained winds of 150 mph (241 km/h), near the uppermost limit of the modern-day ranking Category 4. With this strength the hurricane passed near the Turks and Caicos Islands, though its intensity at the time was based on the extent of damage there as any measurement device was knocked out by the damaging winds. Shortly afterward, the cyclone struck the Bahamian island of Mayaguana at its peak intensity. After passing the island, the hurricane slightly weakened but maintained formidable strength as it accelerated through the southern Bahamas, passing near Nassau on September 17. The storm then made a second landfall on Andros Island in the Mangrove Cay district early on September 18. Thereafter, the hurricane crossed Andros Island and passed over the Gulf Stream en route to Florida. This trajectory brought the storm ashore on the coast of South Florida near Perrine, located just 15 mi (24 km) south of Downtown Miami, before 12:00 UTC on September 18 with winds of 145 mph (233 km/h) and a minimum pressure estimated at 930 mb (27.46 inHg). At the time, the hurricane was very large in size, with a radius of outermost closed isobar 375 miles (604 km) across; hurricane-force winds were reported from the upper Florida Keys to near St. Lucie County. Around 20:30 UTC, the eye of the hurricane passed into the Gulf of Mexico near Punta Rassa; though by that time the pressure in the eye had only risen to 28.05 inHg (950 mb), the winds in the eye wall had decreased to 105 mph (169 km/h). The hurricane had weakened over South Florida as a result of land interaction, but re-strengthened after emerging into the Gulf of Mexico off Punta Rassa six hours later. The warm waters of the Gulf of Mexico allowed for the tropical cyclone to reach a secondary peak intensity with winds of 125 mph (201 km/h)on September 20, equivalent to that of a modern-day high-end Category 3 hurricane. Although the storm had taken a more northwesterly course through the gulf, the hurricane later began paralleling the coast of the Florida Panhandle and thus slowly curved westward. As a result, the major hurricane, now weakening quickly, made its second landfall near Perdido Beach, Alabama, at around 21:30 UTC that day with winds of 115 mph (185 km/h). After landfall, the storm quickly weakened and meandered off of Alabama's barrier islands, eventually moving ashore for the last time on September 21 near Gulfport, Mississippi, as a tropical storm. The cyclone continued its decay inland, degenerating into a tropical depression the following day before dissipating over Louisiana shortly thereafter. On September 16, the United States Weather Bureau advised caution to ships tracking in Bahamian waters and the Florida Strait. The first tropical cyclone warning associated with the storm was a northeast storm warning issued on September 17 for the Florida coast from Jupiter Inlet to Key West, Florida. Warnings along the United States Eastern Seaboard eventually stretched as far north as Charleston, South Carolina, upon the storm's first landfall. Additional warnings were posted for the United States Gulf Coast on September 19 and covered coastal areas from Apalachicola, Florida, to Burrwood, Louisiana. Information on the storm as ascertained by the U.S. Weather Bureau was relayed by various radio and local press services, though the bureau specifically acknowledged the Mobile Register for their efforts in disseminating storm details. Although no fatalities were reported, the hurricane wrought extensive property damage to Grand Turk Island. Rain gauges recorded 10 inches (254 mm) of rain during the storm, and high surf left knee-deep sand drifts on the island. The ocean covered the land up to .75 mi (1.2 km) inland, and winds unroofed buildings at the weather station. Reportedly, the winds even ripped spines from prickly pear cacti. Nearly all lighters at port were lost. The storm left 4,000 people homeless on three of the islands in the Turks and Caicos. Due to hampered communication, the extent of damage in the Bahamas was initially unclear. In the Bahamas, the storm flattened hundreds of structures and killed at least 17 people, mostly on Bimini, where seven people died and the greatest property damage occurred. The hurricane also leveled many structures on Andros, including churches and large buildings, and downed trees and other homes on New Providence. On parts of Andros, the storm snapped or felled almost all of the coconut palms, and in the Exuma district a large storm surge ruined many crops. The storm also destroyed 60% of the homes on the north island of Bimini, left water up to 7 feet (2.1 m) deep in some areas, and was widely considered the worst storm on record in Bimini to date. Some sources say 25 people died on Bimini, but these may have been indirect deaths, as many people reportedly perished after drinking contaminated well water. The 1926 hurricane is known primarily for its impacts and lasting aftermath in South Florida, particularly in the Miami area. Effects were concentrated around Florida's southeastern coast and south-central Florida, with additional impacts in Northwest Florida. Damage figures from the storm in the state alone reached US$75 million and accounted for most of the damage that the tropical cyclone produced. Although the official number of fatalities would later be revised downward, initial estimates suggested that the death toll would likely be over 1,000 in Miami alone with an additional 2,000 injured. Nonetheless, the grave number of casualties forced resorts to serve as temporary morgues and hospitals. Homes and office buildings were used to serve as refugee camps for the approximately 38,000 people displaced by the hurricane. The storm surge in South Florida was not as high as it would have been had the hurricane struck another area, owing to the deep offshore continental shelf, which reduced the energy needed to sustain a large surge. However, along Biscayne Bay, the hurricane produced a substantial storm surge; visual estimates suggested a peak height of 14–15 ft (4.3–4.6 m) in Coconut Grove, and a value of 13.2 feet (4.0 m) occurred at Dinner Key, though the value was somewhat lower at 11.7 feet (3.6 m) along Biscayne Boulevard in Downtown Miami. In fact, the storm surge measured in the 1926 hurricane was the highest ever officially documented on the east coast of South Florida until observers recorded a height of 16.89 ft (5.1 m) at the Burger King International Headquarters near Cutler in Dade County during Hurricane Andrew in 1992. The hurricane's high storm surge swept into Miami and Miami Beach, flooding city streets with knee-deep water. Yachts and large vessels were carried by the intense wind and waves onto shore. The MacArthur Causeway connecting Miami and Miami Beach was submerged under 6 ft (1.8 m) of water. Communication between the two locales as well as the rest of the United States was cut after all local telecommunications and power lines were blown down. Due to their susceptibility to strong winds, most wooden buildings in Miami were either blown down or lost their roofs. Concrete and steel buildings were warped at their bases. While skyscrapers mostly sustained minor damage, the 18-story Meyer-Kiser Building bore considerable damage. The structure reportedly swayed and vibrated precipitously during the storm; eyewitnesses likened it to the Charleston dance. Many of the injuries in the city were due to ballistic fragments of broken roofing including iron sheeting. Other structures across the region sustained significant damage. Strong winds leveled "hundreds" of working-class homes in Hialeah and severely damaged 70% of the town. Winds destroyed the interiors of buildings in Fort Lauderdale, the seat of Broward County, and ripped the roof from the Broward County courthouse. Despite having only 12,000 inhabitants, the town sustained severe damage to 3,500 of its buildings. Nearby, the storm severely damaged the abandoned New River House of Refuge. Cities as far north as Lake Park (then called Kelsey City) and West Palm Beach in Palm Beach County reported many roofs blown off, numerous small buildings destroyed, walls blown down, windows shattered, and trees, shrubs, and other objects torn apart or uprooted. The worst destruction occurred in the poorer, mostly black sections of the towns, where many homes were destroyed. Along the east coast of South Florida, the storm caused widespread, significant beach erosion. At Hillsboro Inlet Light, high tides removed 20 feet (6.1 m) of sand beneath the lighthouse. The hurricane swept away much of State Road A1A in Broward and Miami-Dade Counties. The combined force of waves and storm surge undermined coastal structures that collapsed, including multi-story casinos on Miami Beach, and washed out the coastal bridge on Florida State Road A1A at Baker's Haulover Inlet. In Boca Raton, waves were so large that they rose to the top of the high ridge on the barrier island, though they did not overtop it. High surf also destroyed a casino at the Boca Raton Inlet. "Knee-deep" water east of U.S. Route 1 (Federal Highway) in Boca Raton blocked beach access, but residents waded through. Meanwhile, large waves left much debris and sand drifts several feet deep on State Road A1A in Delray Beach. The waters of the Lake Worth Lagoon overflowed their banks, submerging nearby streets, parks, and golf courses. High tides piled debris on the streets of Palm Beach, caused a beachfront boardwalk to collapse, and exacerbated previous damage from the July hurricane. On Hollywood beach, waves smashed windows and invaded the interior of the Hollywood Beach Hotel. People on the second floor found sand drifts reaching "half way to the ceiling." The storm also ravaged entertainment venues and historic sites. The storm flattened the Fulford–Miami Speedway in North Miami Beach, which then ceased operation. Winds peeled into pieces the roof of the grandstand at Hialeah Race Track and destroyed the kennels, allowing racing greyhounds to escape. The storm wrecked prominent restaurants and tourist attractions on Miami Beach, including the Million Dollar Pier. Many historic structures throughout South Florida sustained significant damage, including the Barnacle and the Villa Vizcaya where the yacht Nepenthe and fishing boat Psyche. were sunk. The storm damaged the main residence at the Bonnet House—the only hurricane to do so since it was first built. No other storm since 1926 caused a similar level of destruction to the property until Hurricane Wilma in 2005. The storm ruined cultivated areas throughout South Florida. The storm flooded the surrounding citrus crop and agricultural fields south of Miami, particularly near Homestead and Florida City, destroying half of the citrus-bearing trees in the area. Much of the citrus crop in Dania was a total loss as floodwaters submerged the area to depths of 6 ft (1.8 m); flooding lingered for more than a week after the storm. A storm surge from Lake Okeechobee entirely inundated Clewiston, reportedly leaving numerous bodies along the road connecting the city with Miami. Further inland, the surge burst through frail, earthen, 6-foot (1.8 m) tall muck dikes, submerging Moore Haven under 13–15 ft (4.0–4.6 m) of water. Residents scrambled, often unsuccessfully, to safety on rooftops but were swept away by the winds and storm surge. A nearby drainage dam was destroyed, causing additional flooding of the countryside. Most of the city's buildings were swept off of their original foundations. Reports by the Red Cross and local authorities indicated that 150 human corpses were found in Moore Haven alone; their estimates were incomplete as many bodies were never found, reportedly having been swept deep into the Everglades. Estimates of the dead near Lake Okeechobee ranged as high as 300. Two years later, another Category 4 hurricane killed at least 2,500 people along Lake Okeechobee, but mostly affected the eastern shore, leaving Moore Haven largely unscathed. The Gulf Coast of the Florida peninsula saw comparatively less damage compared to Greater Miami but still suffered significant impacts. A peak storm tide of 11 to 12 ft (3.4 to 3.7 m) affected Punta Rassa and the islands of Captiva and Sanibel, causing $3,000,000 in flood damage. The storm opened Redfish Pass between Captiva and North Captiva islands. Between Tampa and Naples, strong winds destroyed windows and felled trees and power poles. In Fort Myers, citrus crops sustained some damage and public utilities were put out of commission. Strong winds uprooted trees in St. Petersburg, while heavy rainfall caused flooding in the outlying districts of nearby Tampa. South of the eye, a storm tide of 8 ft (2.4 m) submerged the streets of Everglades City, forcing people into the upper stories of buildings. Homes that were not secured to their foundations floated away on the tide. Tides reached 4 to 5 ft (1.2 to 1.5 m) as far south as Flamingo, sending seaweed, fish, and mud into dwellings. Although the hurricane weakened before striking the upper Gulf Coast, its slow movement produced substantial effects to coastal regions between Mobile and Pensacola; these areas experienced heavy damage from wind, rain, and storm surge. Wind records at Pensacola indicate that the city encountered sustained winds of hurricane force for more than 20 hours, including winds above 100 mph (161 km/h) for five hours. The storm tide destroyed nearly all waterfront structures on Pensacola Bay and peaked at 14 ft (4.3 m) near Bagdad, Florida. Rainfall maximized at Bay Minette, Alabama, where 18.5 inches (470 mm) fell. The disarray in Miami following the hurricane's passage led a breakout of looting in the city's African-American districts that resulted in seven arrests. This unrest prompted the declaration of martial law with the swearing-in of 300 special policemen for voluntary duty. Similarly, 200 policemen were placed on duty in Hollywood, Florida. After a survey indicated that the available food and water supplies would only last 30 days, hoarding was banned. Soup kitchens were set up in Miami's business district in order to serve food to the recently displaced and as a source for clean drinking water that was contaminated in other areas. The first aid arriving from outside the impacted areas was a relief train guarded by state militiamen that carted medical staff, medicine, potable water, and other relief supplies into Miami immediately following the storm's passage. Afterwards, then-U.S. president Calvin Coolidge placed the United States Army and Coast Guard on standby should relief efforts necessitate their presence in Florida and the Bahamas. The Red Cross offered its facilities and the Pullman Company offered its resources for use in relief efforts. The National Guard of the United States dispatched several companies of guardsmen to disaster areas following urgent appeals from then-Florida governor John W. Martin. In response to the widespread destruction of buildings on Miami Beach, John J. Farrey was appointed chief building, plumbing and electrical inspector. He initiated and enforced the first building code in the United States, which more than 5,000 US cities duplicated. According to the American Red Cross, the storm caused 372 fatalities, including 114 from the city of Miami, but these totals apparently do not include deaths outside the United States. Prior to 2003, the National Weather Service had long accepted 243 as the number of deaths, but historical research indicated that this total was far too low. The NWS then updated its totals to reflect the new findings. Even the estimates for the United States are uncertain and vary, since there were many people, especially transients and colored migrants in South Florida, listed as "missing". About 43,000 people were left homeless, mostly in the Miami area. The toll for the storm in the United States was $100 million ($1.42 billion 2019 USD). It is estimated that if an identical storm hit in the year 2005, with modern development and prices, the storm would have caused $140–157 billion in damage ($196 billion in 2016); this would make the storm the costliest on record in the United States, adjusted for inflation, if it were to occur in contemporary times. The University of Miami, located in Coral Gables, had been founded in 1925 and opened its doors for the first time just days after the hurricane passed. The university's athletic teams were nicknamed the Hurricanes in memory of this catastrophe. The school's mascot is Sebastian, an ibis. The ibis is a small white bird that can be seen around South Florida, including on the UM campus. According to folklore, the ibis is the last bird to leave before a hurricane strikes and the first to return after the storm, hence its selection for the school mascot. Panoramic view of Miami after the hurricane, wryly titled "Miami's New Drydock" ; September 18, 1926. ^ For consistency, Coordinated Universal Time (UTC) is used for all references of time as the cyclone existed in multiple time zones throughout its existence. ^ a b c d Blake, Eric S.; Gibney, Ethan J. (August 2011). The Deadliest, Costliest, and Most Intense United States Tropical Cyclones from 1851 to 2010 (and Other Frequently Requested Hurricane Facts) (PDF) (United States National Oceanic and Atmospheric Administration Technical Memorandum). Miami and Asheville, North Carolina: National Hurricane Center. Retrieved January 1, 2015. ^ a b "17 Killed in the Bahamas". New York Times. The Associated Press. September 24, 1926. ^ a b Weinkle, Jessica; et al. (2018). "Normalized hurricane damage in the continental United States 1900–2017". Nature Sustainability. 1: 808–813. doi:10.1038/s41893-018-0165-2. ^ a b c d e f Landsea, Chris; et al. (April 2014). "Documentation of Atlantic Tropical Cyclones Changes in HURDAT". Miami, Florida: Atlantic Oceanographic and Meteorological Laboratory. Retrieved January 1, 2015. ^ a b c d e f Mitchell, Charles L. (October 1926). Henry, Alfred J.; Varney, Burton M. (eds.). "The West Indian Hurricane Of September 14–22, 1926" (PDF). Monthly Weather Review. 54 (10): 409–414. Bibcode:1926MWRv...54..409M. doi:10.1175/1520-0493(1926)54<409:TWIHOS>2.0.CO;2. Retrieved January 1, 2015. ^ a b c Goodwin, George (October 1926). "The Hurricane At Turks Island, September 16, 1926" (PDF). Monthly Weather Review. 54 (10): 416–417. Bibcode:1926MWRv...54..416G. doi:10.1175/1520-0493(1926)54<416b:THATIS>2.0.CO;2. Retrieved January 1, 2015. ^ Landsea, Christopher W.; Steve Feuer; Andrew Hagen; David A. Glenn; Jamese Sims; Ramón Pérez; Michael Chenoweth; Nicholas Anderson (February 2012). "A reanalysis of the 1921–1930 Atlantic hurricane database" (PDF). Journal of Climate. 25 (3): 865–85. Bibcode:2012JCli...25..865L. doi:10.1175/JCLI-D-11-00026.1. Retrieved November 28, 2012. ^ a b Frank, Josh (September 18, 2006). "A date with disaster: '26 storm would be devastating". South Florida Sun-Sentinel. Fort Lauderdale, Florida. pp. 1, 4. Storm surge is not usually a major problem on Florida's east coast, where the steep ocean floor and proximity to the Bahamas prevent the swelling of massive waves. ^ "Storm Does Enormous Damage". The Index-Journal. 7 (224). Greenwood, South Carolina. Associated Press. September 17, 1926. p. 1. Retrieved January 1, 2015 – via Newspapers.com. ^ "Bahamas Are Hard Hit by Hurricane; Thousands of People Homeless on 3 Islands". New York Times. The Associated Press. September 22, 1926. ^ a b c "Tropical Hurricane Sweeps Southern Part Of Country". Lancaster Eagle-Gazette. 36 (137). Lancaster, Ohio. Associated Press. September 18, 1926. p. 1. Retrieved January 1, 2015 – via Newspapers.com. ^ a b c d e f g h i "500 Reported Killed In The City Of Miami". Portsmouth Daily Times. EXTRA. Portsmouth, Ohio. Associated Press. September 20, 1926. p. 1. Retrieved January 1, 2015 – via Newspapers.com. ^ "The Day Miami Almost Blew Away". Miami Herald. September 18, 1976. ^ Edward Rappaport (December 10, 1993). Hurricane Andrew. National Hurricane Center (Preliminary Report). Miami, Florida: United States National Oceanic and Atmospheric Administration's National Weather Service. Retrieved November 27, 2014. ^ "Highlights of the Storm". Portsmouth Daily Times. EXTRA. Portsmouth, Ohio. Associated Press. September 20, 1926. p. 1. Retrieved January 1, 2015 – via Newspapers.com. ^ a b c d "Survey Reveals Delray Damage". Delray Beach News. September 24, 1926. p. 1. ^ a b "City Is Cut Off From Nation When 100 Mile Hurricane Rages". Palm Beach Post. September 19, 1926. ^ "Bulletins". Palm Beach Post. September 19, 1926. ^ Skip, Sheffield (June 28, 1981). "Stark memories of storms gone by". Boca Raton News. ^ National Weather Service (January 8, 2009). "Memorial Web Page for the 1926 Great Miami Hurricane". srh.noaa.gov. Miami, Florida: National Weather Service. Retrieved February 21, 2015. ^ a b Williams, Mrs. Arthur (September 24, 1926). "Boca Raton News". Delray Beach News. p. 15. ^ "Many Buildings in Lake Worth Razed by Storm". Palm Beach Post. September 19, 1926. ^ "Fulford-Miami Speedway - Post Hurricane". Getty Images. January 11, 1927. Retrieved August 21, 2013. ^ "Miami-Fulford Speedway". NA-Motorsports. Retrieved August 21, 2013. ^ "Our History". thebarnacle.org. Coconut Grove, Miami, Florida: The Barnacle Society. Retrieved February 21, 2015. ^ Wooldridge, Jane (September 16, 2012). "Vizcaya Museum & Gardens in Miami shows a keen eye for detail". Los Angeles Times. Los Angeles. ^ Sandler, Nathaniel; Wouters (Curator), Gina (2016). "Maritime Vizcaya – Boats and Boating Culture at the Estate (December 2016)". Vizcaya Museum & Gardens. Retrieved September 2, 2018. ^ National Weather Service (June 29, 2009). 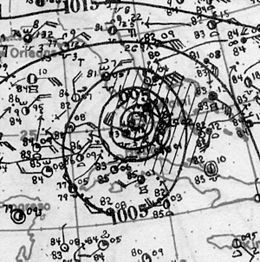 "Memorial Web Page for the 1928 Okeechobee Hurricane". srh.noaa.gov. Miami, Florida: National Weather Service. Retrieved February 21, 2015. ^ United States Corp of Engineers (1945). Storm Total Rainfall In The United States. War Department. p. SA 4–23. ^ "Bread Lines Appear In Miami; A Relief Train Rushed There". Portsmouth Daily Times. EXTRA. Portsmouth, Ohio. Associated Press. September 20, 1926. p. 1. Retrieved January 1, 2015 – via Newspapers.com. ^ "Nation To Rush Aid". Portsmouth Daily Times. EXTRA. Portsmouth, Ohio. United Press. September 20, 1926. p. 1. Retrieved January 1, 2015 – via Newspapers.com. ^ Pielke, Roger A., Jr.; et al. (2008). "Normalized Hurricane Damage in the United States: 1900–2005" (PDF). Natural Hazards Review. 9 (1): 29–42. doi:10.1061/(ASCE)1527-6988(2008)9:1(29). Archived from the original (PDF) on June 17, 2013. ^ Malmstadt, Jill; Scheitlin, Kelsey; Elsner, James (2009). "Florida Hurricanes and Damage Costs". Southeastern Geographer. 49 (2): 108–131. doi:10.1353/sgo.0.0045. ^ a b c Gannon, Michael (2012). The New History of Florida. Gainesville: University Press of Florida. ISBN 978-0-8130-1415-9. ^ "Traditions :: University of Miami". Archived from the original on October 17, 2007. Retrieved November 8, 2007. Wikimedia Commons has media related to Miami Hurricane of 1926. "In the wake of Hugo: The '26 storm revisited" (PDF). South Florida History Magazine (4). 1989. pp. 10–13. A first hand account written in 1926. "The Hurricane of 1926". Mr. Miami Beach. American Experience. PBS. Archived from the original on January 14, 2016.